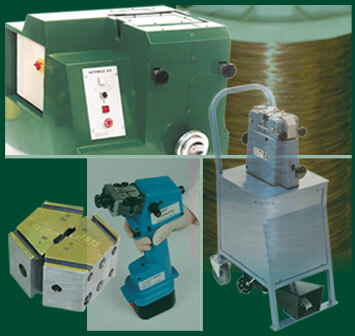 Need to weld copper, aluminum, or other non-ferrous metal wires or strips? Koldweld®’s line of professional-quality, cold-pressure welding equipment bonds metals through the application of pressure alone. Pressure so powerful it creates a bond that’s even stronger than the original metal. And speaking of originals… Koldweld® is the oldest name in the business. We’ve been manufacturing cold-pressure equipment for over 65 years. Our systems are proven to be fast, easy, and reliable. Not to mention economical. They even eliminate the need to stop and rethread spooling machines. Check out our equipment. Then give us a call. Maybe we can take the heat off your next welding project. Call us toll free at (800) 587-6039.